If you’ve been following along for awhile, you’ve seen my previous recipes inspired by the calendar I got a Fausto’s Market in Key West. 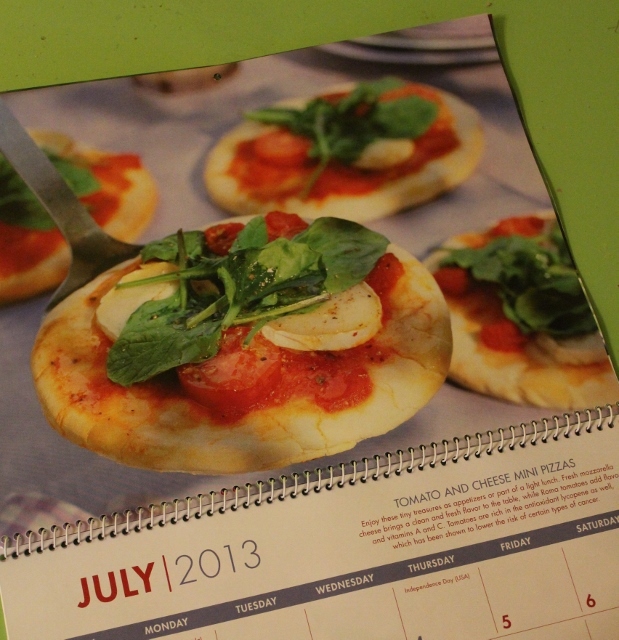 I’ve been working through the recipes in the calendar, coming up with a variation that fits into my eating plan. This month’s recipe was for Tomato and Cheese Mini Pizzas. My variation isn’t as large as the pizzas in the calendar. It also doesn’t have cheese, but instead a wonderful sunflower seed cream that is a bit like ricotta. The sauce is a raw sauce, which makes these perfect nibbles for dinner on a hot evening. I make the crusts in advance and keep them handy in the freezer. Just defrost them on the counter and you’ll have a quick dinner for a Summer night when the oven is best left off. 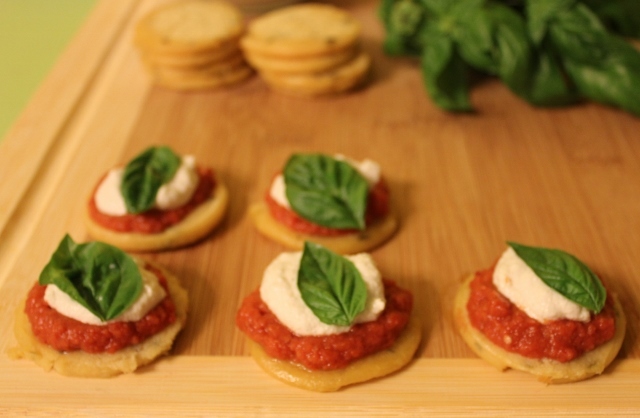 To make these, you will need three recipes: Mini Socca Pizza Crusts, Sunflower Seed Cream and Rawmato Pizza & Pasta Sauce. I’ve created a separate printable recipe for each in case you want to make just one component of this recipe. 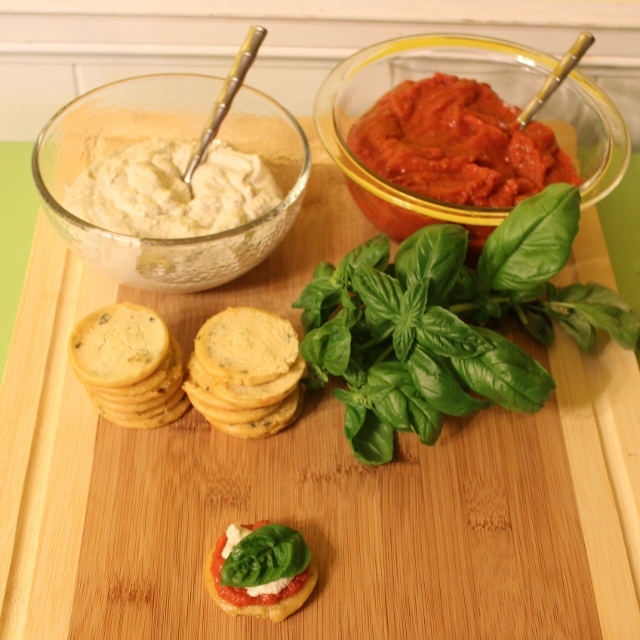 To assemble, top a crust with a spooonful of Rawmato Sauce, a spoonful or Sunflower Seed Cream and a fresh basil leaf. No baking required! The pizza crusts are terrific topped with much more than I’ve shared here. I like them with hummus and a strip of a roasted red pepper on top. The sunflower seed cream is terrific on raw zucchini noodles or even as a sandwich condiment. And the Rawmato sauce is great on anything that resembles pizza or pasta. It’s my go-to marinara type sauce. I hope you enjoy all of these as much as I do! Combine all ingredients in high speed blender or food processor, blending until smooth. If the cream is too thick, you may add a bit more water, no more than a teaspoon at a time, until the desired thickness is reached. 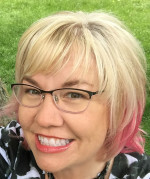 I’m linking this post up with Gluten Free Homemaker’s Gluten-Free Wednesday. Be sure to click over to see all of the terrific gluten-free submissions! « Kale Basil Pesto, with a freeze-ahead option!